"SOMETIMES YOU NEED TO MAKE YOUR LIPSTICK TELL THE STORY. In this case, the brand actually tells the story..."
Today I am going to review the MatteTrance lipstick all from the Patmcgrathreal Lipstick brand. Price of lipsticks:- $38 for 4g/.14oz, 5.7" x 1.0" x 8.9". A revolutionary lipstick so luxurious and richly pigmented, it drenches lips in a lightweight veil of opaque color while delivering a mesmerizingly modern matte finish. Sensually creamy and brilliant in texture, this collection evokes the femme fatale siren with every application. Colour and finish so sinful, your pout will speak volumes without ever whispering a word. - Innovative formulation combines a strong matte finish with highly saturated pigmentation. - The vivid and vibrant collection of colors leave lips feeling luscious and smooth, with a supple, cushiony feel. - Formulated with optical diffusers that blur the appearance of imperfections. - A blend of polymers provides flexibility and adherence. - An advanced formulation of spherical particles ensures a creamy, soft texture for the smoothest film of color. - Combines powder film with a saturated pigment for lightweight opaque coverage. Experience a new dimension of lip color with these simple techniques to enhance your lust-worthy pout. Begin by smoothing lips with an exfoliant, then gently neutralize natural lip color with a touch of concealer. To define the lip and enhance staying power, choose a coordinating PermaGel Ultra Lip Pencil. Use the finger to press and roll color onto the lip. Start in the middle of the bottom lip and transfer color onto the lips with the index finger, working outwards to either edge. Repeat on the top lip. After applying lipstick, gently pull a tissue apart so you end up with two thin sheets. Press one of the sheets against the lips and lightly dust with translucent setting powder. I picked up 3 shades from this entire range. 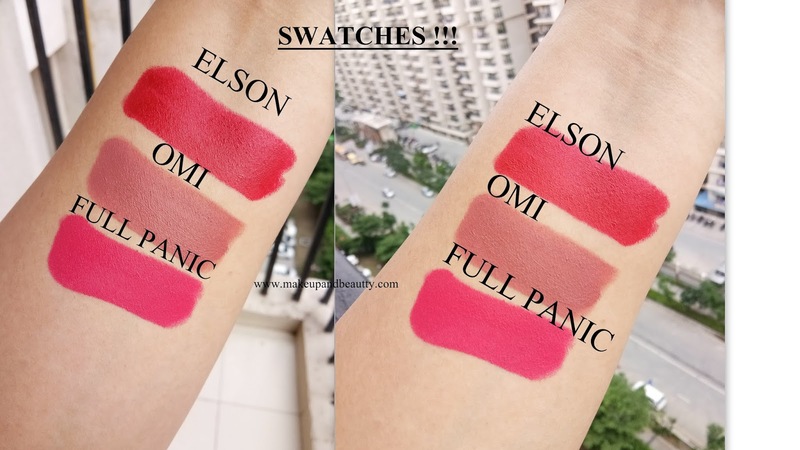 They are OMI, ELSON and FULL PANIC. OMI: A muted medium dark pink with neutral undertone. It look a bit similar Mac Mehr on my lips. ELSON: A cool red shade. Isononyl Isononanoate, Aluminum Starch Octenylsuccinate Polybutene, Polyethylene Dicalcium Phosphate, Paraffin, Polyhydroxystearic Acid Synthetic Wax, Copernicia Cerifera (Carnauba) Wax/Cera Carnauba/Cire De Carnauba, Hydrogenated Soybean Oil Stearic Acid, Microcrystalline Wax/Cera Microcristallina/Cire Microcristalline Bis-Diglyceryl Polyacyladipate-2, Pentaerythrityl Tetra-Di-T-Butyl Hydroxyhydrocinnamate, Squalane, Caprylic/Capric Triglyceride, Kaolin, Stearalkonium Hectorite Propylene Carbonate Nylon-12. May Contain (+/-): Titanium Dioxide (Cl 77891) Mica, Blue 1 Lake (Cl 42090), Red 6 (Cl 15850), Red 7 Lake (Cl 15850), Yellow 5 Lake C(L 19140) Yellow 6 Lake (Cl 15985), Red 28 Lake (Cl 45410), Red 30 Lake (Cl 73360), Iron Oxides (Cl 77491, Ci 77492, Ci 77499). 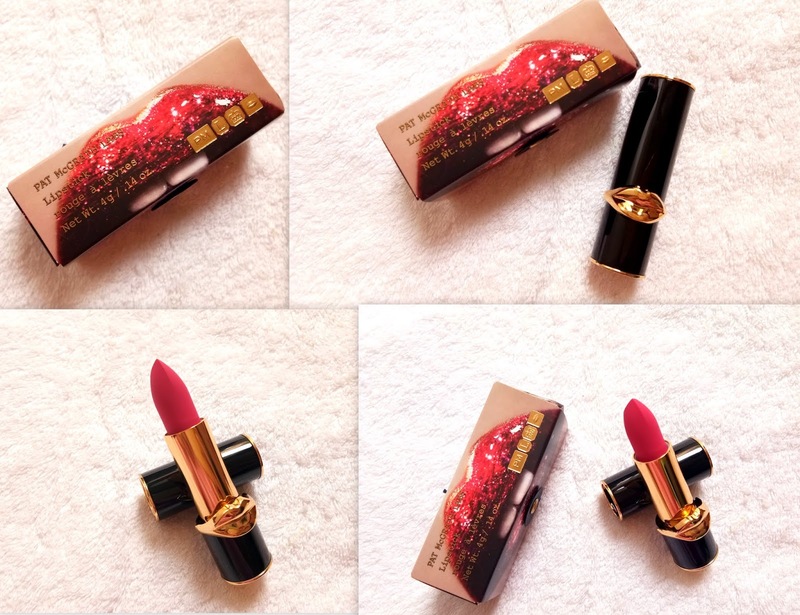 Patmcgrathreal is a brand who always comes up with "luxury in packaging". Starting with the outer carton box with a unique way of opening and closing it with a thread, followed by the golden lip pout on the lip case everything is just pure luxury in packaging. The lipstick case feels a bit heavy and it adds a class in your lipstick stash (packaging wise). When it is Patmcgrathreal, then it is simply wastage of time that how the products will be. Patmcgrathreal is famous for its quality. Anyone tried out this brand will definitely become addicted to grabbing more products from this brand. 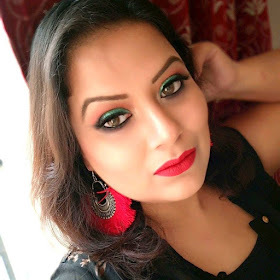 I tried out their MatteTrance lipsticks first as I am a die hard fan of matte lipsticks. The very first day I applied the lipstick I just have fallen in love with the quality of these lipsticks. I picked up three shades back to back as I was loving the texture of these lipsticks so much. 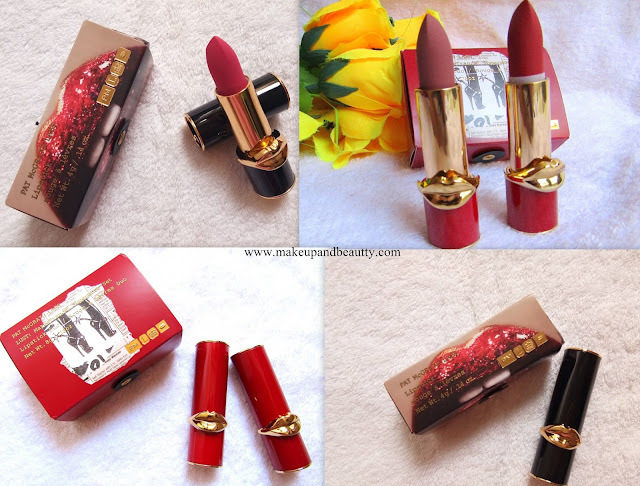 The texture of the lipsticks is matte but comfortable one. They are super pigmented. One swipe and bammmmmm! you will get an opaque coverage. The lipsticks are comfort matte on my lips. If we dab a tissue on top of these lipsticks this will turn super matte and it will increase the longitivity of wearing time of lipsticks. The lipstick stays 8 hours+ on my lips with slight fading. The dark shades leave a light stain on my lips even after removing it properly. In short, these lipsticks lays down a high impact with a strong finish. These are one of the best lipsticks in the makeup world. The only con of these lipsticks is they are little pricey. But again good things come with a price tag. So, that's all for today. See you in my next post.